"I don't want them to forget Babe Ruth, I just want them to remember me too." I think that this sports quote has inspired me many ways. 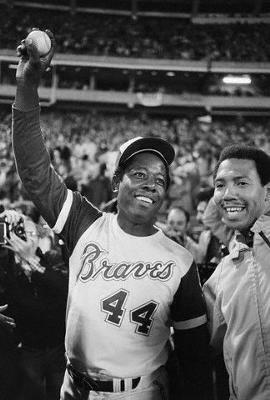 When I hear it I think of some of the horrible things that Hank Aaron had to put up with when overtaking Babe Ruth in the all-time home run race. Living with death threats aimed at him and his family was a daily occurrence. But he kept on swinging, and he kept on hitting those home runs. Today he is revered as a hero in many ways, but today's generation is not learning of the struggle he had to go through. I think this quote sums things up for his situation. He was the target of so much hate, but yet he didn't deserve it. He wasn't out to prove that he was better than the Babe Ruth, he only wanted to prove he was just as good. If anything I am ever doing seems to me a bit hard, I just look back and realize that it could be much worse. Also, it helps me realize that if I just keep on working through adversity, there will be great rewards on the other side. Join in and write your own page! It's easy to do. How? Simply click here to return to Favorite Sports Quotes.